So when I have one of those weeks where I really have no idea what to make for dinner, I usually run down this list of potential dishes using pasta, rice, or bread. I didn't feel like having pasta. I was tired of rice and there wasn't any bread left to work with. But deep in one of my fridge drawers there was a package of gluten free pizza crusts. Jackpot! The pizza crusts were actually much thinner than what many would consider pizza so it seemed more fitting to name this a flatbread. So with flatbread on the brain, the next thing to figure out was what to top it with. 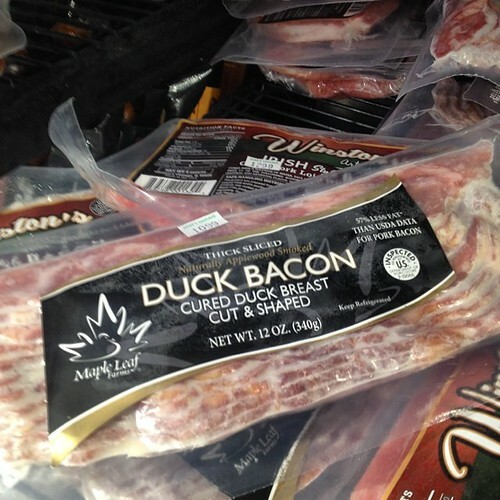 I had previously picked up some duck bacon and fancy blue brie cheese at a great deli while hitting up some gourmet shops in the city. 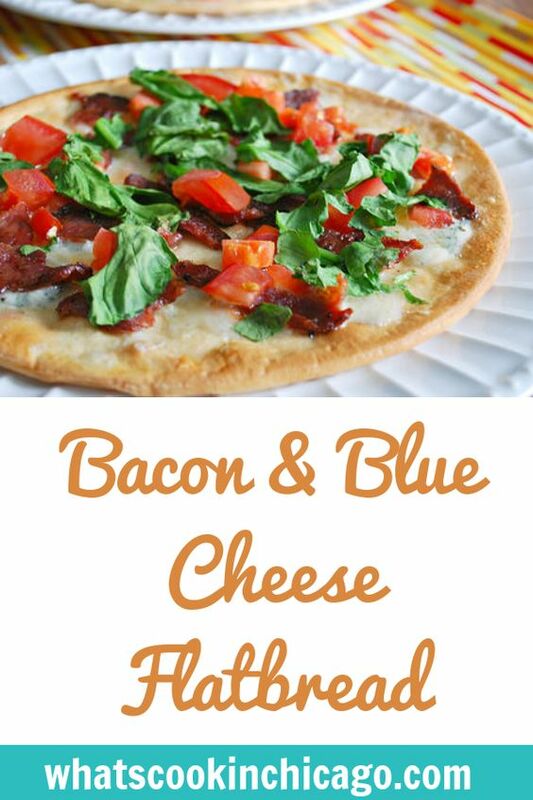 Bacon and blue cheese are a favorite combo of mine in burgers and salads, so why not on a pizza or flatbread too? Thankfully I had just a handful of baby spinach left and a single tomato, which I just added on top of the flatbread just before serving along with a drizzle of garlic olive oil. Before I knew it, we were sitting down to dinner and it was probably one of the best 'on-the-fly' dinners I've made! I guess it helped I had some fancy stuff lying around, but you really don't need all the gourmet upgrades. 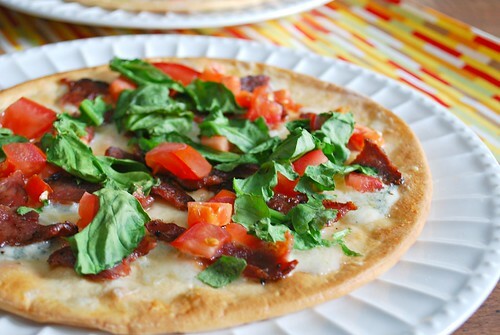 Regular bacon, crumbled blue cheese, spinach and tomato on a regular homemade or store bought pizza crust will work just fine with a drizzle of any extra virgin olive oil! Prepare your pizza dough as directed and bake with no toppings. 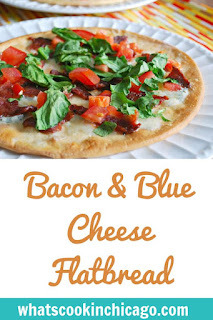 Remove from oven; top with blue cheese and bacon. Return to 375 degree oven and bake for 5-7 minutes, until cheese begins to melt and soften, and bacon crisps up. Remove from oven and garnish with spinach and tomato. Drizzle with olive oil and serve. what a great idea! 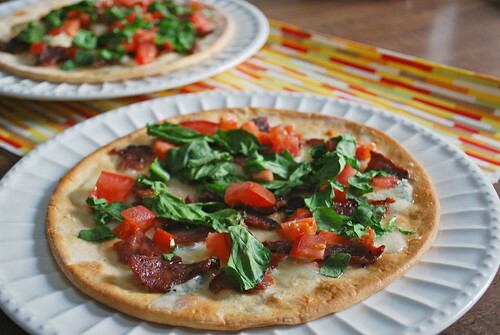 I love flatbread, and will definitely make this. Oooh, but I want all the fancy upgrades!! :) These look delicious.